A Good Start for Fall!! Black Clover will surely Slay this Fall!! It's Manga has a Very good story line with pretty impressive Characters. Looking Forward to this Action-Fantasy Anime!. I hope this New Anime brought by the same team who brought Naruto to us will give us the same feeling or more feelings. 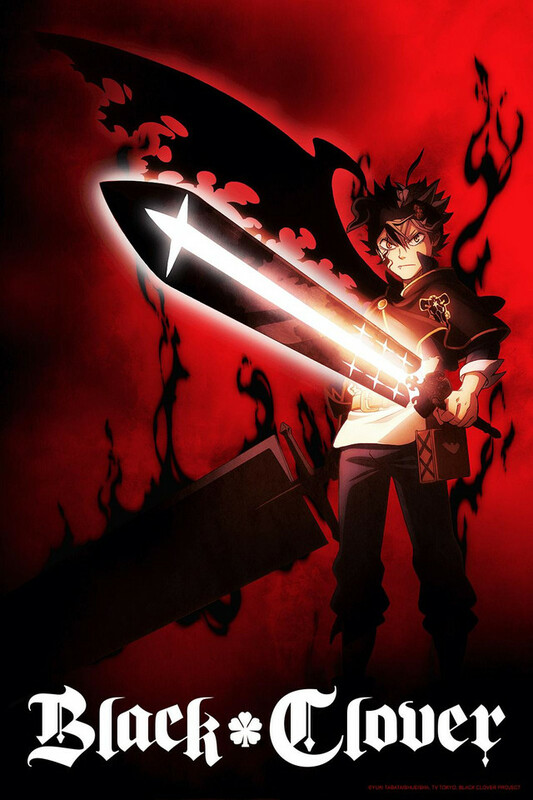 Black Clover is finally here and it is as great I hoped It would be. Black Clover is a tittle most fans are familiar with - even before it's aired - for better or for worse. Unfortunately, it's coming at a time where most fans are so one sided that they cant see past the mainstream mentality in the West. Which is funny because Black Clover is one of the most popular SJ tittles at the moment, frequently outselling the likes of Haikyuu, MHA, and finishing just below One Piece in the rankings. "If this is what people think, I'll think the same" applies for Black Clover by the current generation of fans. "It is generic". "It's a Naruto ripoff". "It takes all the cliches and brings them together". Well, I have news for you. 90% of every other Shounen does that as well - yet people cant see past that with Black Clover because they want to hate on it for the sole reason of hating on it and not appreciating the many positives it has. It's funny how people to selectively choose to judge shows. My Hero Academia was met with great applause over the last year by both fans and critics alike, deservingly so (I enjoy it thoroughly), yet it also had the usual cliches most Shounen has, especially Naruto. "Main character in Deku with no superpowers who got them overnight and thus begin his journey" or the "emo side character who's gifted beyond his generation that has a plagued past that'll follow him to his future in Todoroki" - I know this isn't a review of MHA. The point I'm trying to make is that most fans managed to see past that because MHA has a good mainstream appeal. Hating on it wouldn't feel right. Yet doing so for Black Clover is normal because it has that reputation by the fans. Which is odd. On to the review. I'm a firm believer of not reviewing something from the very beginning, but I felt like I should to reassure fans of Shounen anime and fans who look forward to Black Clover as a manga reader. Long running old school Shounens need time to set the foundations for their success. I enjoy the manga thoroughly. It's one of my personal favorites as well. This series has a ton of potential and episode 1 is a good place to start. It established the grounds really nicely by introducing the two main characters and focusing on them. It covered the OVA really nicely - and I applaud that - because most fans haven't seen the OVA. Good OST as well. This has a lot of promise and it reminds me of what the anime industry seems to not have anymore, an old school Shounen adventure. All I ask is to judge it fairly. Don't pay attention to fans who'll hate on It just for the sole reason to hate on it. See it for yourself but also remember you're not going to get an impression for the get go. It'll need time. This isn't Naruto. This isn't Fairy Tail (for the life of me I dont get the comparison - because magic, right xD). This is Black Clover. Appreciate it for what it is. If people enjoy it, let them enjoy it. Don't be a troll for the sake of wanting to be a troll. Think for yourselves and be reasonable. I have been following this as a manga since it's beginning but I'm happy to finally see this manga become an anime if they continue to stay true to the source material I have no doubt that this series will do very well. It's pretty funny but overall like any anime like it there will be a lot of drama hope you guys enjoy the 13 episodes that they are gonna put out for this! This is going to take three episodes before I can tell whether or not this show will actually be as interesting as it was advertised. As a heads up, this is a review coming from someone who knows very little about this series, all I know is that it was hyped up right before it started airing. So this review shouldn't be biased. I already have some gripes about the show. 1. The main character's VA is really annoying. He is constantly screaming and it makes my throat hurt just hearing it. It astounds me that he will keep talking like that for possibly 12+ episodes. 2. The story so far is somewhat generic and cliche, though the way it's going is not too cliche for my tastes. 3. If you look at it from afar it's very hilariously starting to mirror Naruto. I think it goes without saying that there are some good points already, but I want to wait and see before I go too in depth. It was very funny at times so I'll give it a watch every week! Now that we have gotten to episode 4, I gotta say that I need to see even MORE episodes before I can even call this worthwhile. It kinda bugs me because it's starting to set itself up for a long running show like One Piece or Naruto. If it does, I think this will just be like Fairy Tail with me, where the only reason I watch it is because I had the time to watch it every week. Hopefully, if it doesn't have long seasons like Fairy Tail, etc. then it will pace itself accordingly. I mean, right at the end of ep 4 it did make me want to see the next episode, but I don't really know if it will be as good as I think it is. Tabata has never seen a horse he didn't want to shove a cart in front of. Black Clover is just a series of shonen cliches stapled together end to end. On its own, that's not necessarily a problem; cliches are cliches for a reason, and well-executed cliches can be a lot of fun. The problem is, Black Clover's author, Yuki Tabata, is incapable of sticking the landing, because he always wants to jump straight to the end without doing any of the work. He wants to go directly from the introduction of the trope to its payoff without doing any of the buildup that makes the payoff...pay off. As a result, everything is just limp at best. Worse, this is the kind of issue that effectively CANNOT be fixed in an anime adaptation, because the problem is that nothing happens between point A and point C.
Spare yourself the time and effort. Give Black Clover a skip. Okay, so if you're the kind of person that watches anime to let the pretty pictures wash over your eyes while you shut down your brain and body except to shove snacks in your mouth, then I can see why someone like you would give this 5 stars. However, if you have any concept of the fundamentals of writing and need a good foundation to enjoy a story then skip this one (or just watch for yourself, it's painful). I can already tell from the lazy animation and editing that this is a rushed big shonen cash grab trying to ride the recent success of the manga. we're expected to believe it was the sound of 2 babies that shut up instantly when Father Unnamed Priest uses magic to start a fire WHILE HOLDING A BABY. I know this is nitpicking but seriously this is not how I want to be immersed into a new world. This scene then establishes that one baby is feisty while the other one is quiet. From reading the description I extrapolated that the hot head would end up not having magic and that there'd be an interesting dynamic between a magically powerful guy with very little confidence and counterbalanced by the other. Instead the show gives us a rivalry dynamic between two completely unlikable characters that doesn't make any sense. Asta is established as a completely over-confident idiot with no magic powers who's dialogue is around 90% screaming. That scream, if you haven't heard by now, is easily the most annoying sound ever produced in an anime. The voice actor ends every line he screams with the same "Eeeeaaaahhhh" inflection: it's really bad. Yuno on the other hand is established as an incredibly boring, emotionless character that uses his magic powers to show off and further establish how much of a piece of crap Asta is. We're then told that he does this because they have a rivalry but no background information is given to explain it. This rivalry is brought up later in the episode as integral and important but it has no weight to it. Generally, rivalry works when two individuals of similar talents improve by trying to out-do each other so it just makes no sense. However we do see Asta physically training his body very hard, so my thought was that he might be able to compensate for lack of magic. Asta's training ends up having no payoff though as he receives his own magical powers in a completely baffling scene near the end of the episode. Okay, so this scene is so confusing I have to list my questions. 1. Where is this fight taking place? It looks like it's right outside the Grimoire tower. If so, where is everyone else? 2. Is murder straight up legal in this world or just for rich bully anime tropes? 3. How does Asta run all the way across town to the forest, whine, then come back knowing that Yuno is in trouble in that small of a time period. 4. Assuming that he was watching from the bushes or something, why does he then leap out to Yuno's rescue, hit a wall for a cringy attempt at comic relief, and then act confused as to why rich bully was chained up this makes no sense at all. 5. Where the heck did the black grimoire come from? All the other ones flew off shelves from a giant library. Was the catalyst for this power getting the crap kicked out of him? 6. Why does Asta act like he knew he had this power all along? 7. Why does Yuno act like this makes complete sense? Excelente anime, en un comienzo la voz del protagonista es bastante molesta, pero la historia se desarrolla desde lo cómico a lo interesante de manera sutil e inesperada. Muy recomendable. Recoge aspectos muy interesantes de otros animes similares, pero logra introducirnos a un mundo de magia y poder de elementos y uso de Powerups como el que se ve en la primera sinopsis (2do episodio) donde el uso de la espada de diablo muestra que el poder físico se ve aumentado en segundos. Espero seguir disfrutando, se ve con buen potencial para ser un excelente anime. I am a pretentious douchebag ! Gave the show one star after the first episode. Wrote a 1000 word Review, complaining about stuff. Mostly fueled by the fact that everybody bashed the show. Caught myself enjoying the show and waiting for the new episode to release. Realised ít's a good casual watch that has potenial to grow on me. Many of my points are still valid, show's still enjoyable.